When Java passed it felt a little less painful as we had Mocha to come home to. Now there are no dogs in our home and it feels a little less lively and a little more quiet. It was hard walking into our home and not having either Mocha or Java there to great us. It's going to be difficult over the next few days as I find dog toys or as I walk past the dog bed that sits in our living room. Dinner time is going to feel a little more empty. Mocha used to lay down underneath the dinner table waiting for food to fall and hit the floor (dogs are great at picking up spills and food from kids). I think back to the days when my husband and I first got Mocha. My husband and I had been dating for a year and lived together. We got Mocha (and Java) from a breeder in Pennsylvania. At the time a lot of breeders didn't have websites but we went to one of the few that did and the closest breeder I liked was in Pennsylvania so we went on a road trip. We checked out the breeder's set up and where the dogs were housed (the last thing I wanted to do was purchase a dog from a puppy mill). Some weeks later when she was ready to go we picked her up and drove her home. On the way home she refused to sit in the cardboard box lined with a comforter. Mocha wanted to be with us in the front seat. She spent the entire ride home on the arm rest between us or on the floor of the car behind my seat. She always loved being with us where ever we were. When ever we came home she was always there to greet us and made for a good watch dog. 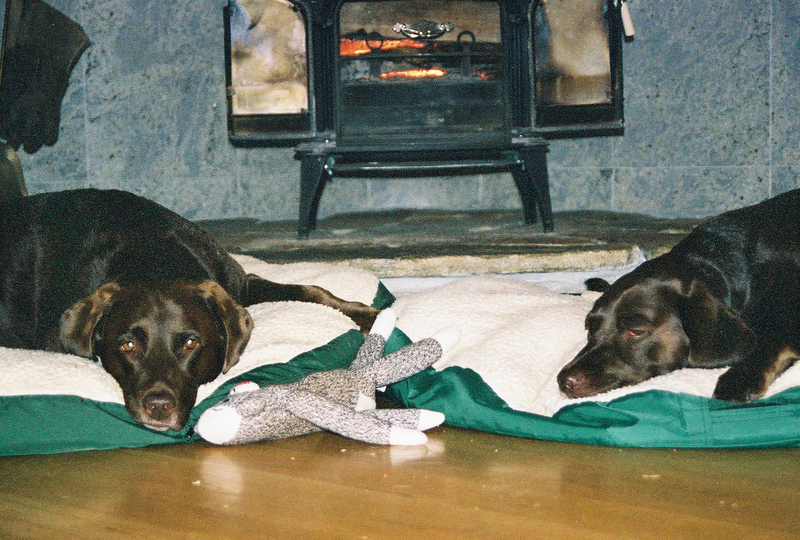 Mocha's personality was very different than Java's. Mocha was calmer than Java and beyond focused when it came to retrieving anything. My father in law would try to kick a tennis ball past her and she was on it before you could blink. She would have made a good goalie in hockey or soccer LOL!! She also loved playing catch with a Frisbee, swimming, car rides, and snagging any food she could reach on the counter or table. When it came to retrieving she would search for items in the woods via hand signal, voice command or by whistle. 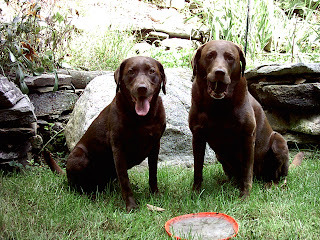 We would throw a couple tennis balls out in the woods and send them out to retrieve them. Mocha was very quick to find a tennis ball. She would circle around and then look at us and wait for a signal as to what direction she should go to next. After finding it we would then direct her to help Java find the other one and she always did. She was always really good at retrieving things like shoes and making lovies out of worn socks (we had to make sure everything was picked up). 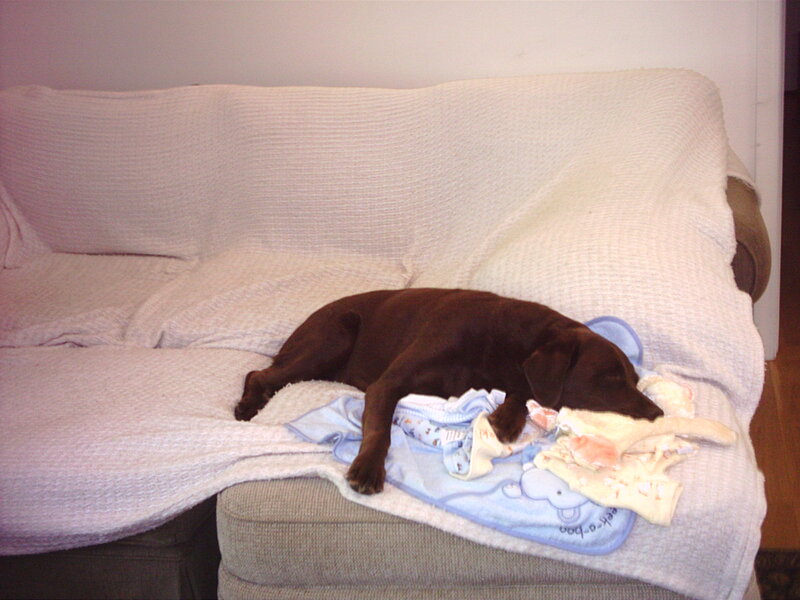 Mocha was a very intelligent, funny, loving, food driven dog :-) When she was less than a year old and I was in college she would help me study. She would get up on the couch, lay down and put her paws on the notebook or book I was reading. She was trying to tell me: 'I'm here!' in the most subtle of ways. In her older years when I had my children she was the most gentle loving dog (Java too) and was so patient with them. My boys were sometimes rough with her when they were toddlers and she never minded. I remember when I was pregnant with my first born. Mocha would come up to me and sniff my belly (something she never did before). She new something was going on. After I had my baby shower I spent time taking the tags off of baby clothes and blankets. Upon my return of putting the tags in the trash she laid on top of the pile of towels, blankets, clothes and fell asleep. Something she had never done before and had never done since then in all my years of folding laundry. There are so many great memories of her and I plan to carry them with me. We will be honoring her death and Java's with a ceremony at home as a family. We will miss her always.